Thanks to those of you who have asked about my family since Typhoon Haiyan (also referred to as Typhoon Yolanda) devastated the central and southern Philippines. My family lives in Luzon and I am grateful that they were out of harms’ way. But many families of my friends are among the masses who have lost their homes, livelihoods and loved ones. As difficult as it is to fathom such trauma, I know we don’t want to be paralyzed by it. Would you please join me in taking action, in following our impulse to help and to extend hope? Eligibility: Anyone in the continental United States and Hawai’i may enter. Each Entry is $10, but you can donate as much as you want, i.e. $20 is 2 entries, $30 is three entries. Prize: One lucky winner will receive “Waiting for a Prince” (digital photograph, image size 8″x12″, matted 16″x20″). I will pay for shipping of this matted print. Donation/Entry Process: Between Dec. 1 and Dec. 15, 2013*, please make a donation to the National Alliance for Filipino Concerns. Every $10 you give is an entry for this contest. You MUST forward your confirmation email from NAFCON to me (carina@cadelrosario.com) and please include your name and preferred contact information. I will reply with your entry number and contact you if you win! I will take “donations” until midnight PST on Dec. 15. The winner will be picked via Random.org and I will post the results of the drawing on Dec. 16. * I know many of you have already donated to different Typhoon Haiyan relief efforts. THANK YOU for your quick response! The survivors of this super typhoon have a very long and hard road to recovery, so there is still a need for monetary support for temporary shelter, food and other necessities as local people work to rebuild. This raffle is meant to spur new donations to help with the on-going need, so donations must be made between Dec. 1 and Dec. 15, 2013 in order to qualify as a raffle entry. In September 2011, I returned to my birthplace. I was in Manila when Typhoon Pedring hit Luzon. It was nowhere near the force of Typhoon Haiyan, but it did break through the seawall. 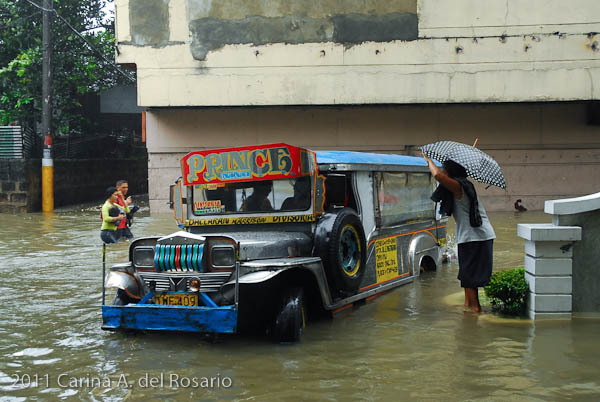 While I was waiting for the waters to recede, I saw strangers on this jeepney helping each other: Men would carry a passenger on their backs, deposit them onto higher ground, then go back for one or two more before moving on with their day. After Typhoon Haiyan, Filipinos continue to help each other. They aren’t necessarily waiting for princes to come to the rescue, but they are relying on each other and the global community to provide whatever resources we can share so they can take charge of their recovery and rebuild on their own terms. Please join me in supporting their efforts.